Fire Touched is the latest Mercy Thompson novel by Patricia Briggs. Mercy, a coyote shifter, while battling a Troll on a bridge to keep it from decimating the Tri-Cities population, makes a magical statement declaring the Columbia Basin Pack protectors of that territory. This is the beginning of a fantastic story of one of my favorite fantasy characters. Mercy and her husband Adam, the Alpha of the Columbia Basin Pack, find themselves guarding, and temporarily adopting a boy named Aiden. Aiden has been trapped in Underhill, where the fae live, and now has “fiery” magical powers that make him a valuable commodity. The following synopsis comes directly from Amazon.com. Tensions between the fae and humans are coming to a head. And when coyote shapeshifter Mercy and her Alpha werewolf mate, Adam, are called upon to stop a rampaging troll, they find themselves with something that could be used to make the fae back down and forestall out-and-out war: a human child stolen long ago by the fae. Defying the most powerful werewolf in the country, the humans, and the fae, Mercy, Adam, and their pack choose to protect the boy no matter what the cost. But who will protect them from a boy who is fire touched? If you have not read this series, you need to pick up the first book Moon Called, so you can start reading the evolution of Mercy. Fire Touched is #9 in the series, and she is pretty far along on her journey. Mercy and Adam, although still newlyweds, have settled in to their marriage, although Adam has to rein in his protectiveness, frequently. Somehow trouble always seems to find them, and Mercy is usually at the center of it. That is actually one of the things that make these books so great. Mercy does not fear getting involved, and her decisions may not always benefit her, but they are always the best decision for whoever it is she is helping. In Fire Touched, Mercy’s magical statement makes things pretty difficult for her pack, yet it is exactly the catalyst that is needed to move her relationship with them to another level, and in the end make their pack a stronger unit. I have also been eagerly anticipating, and slightly hopeful for a pregnancy for Mercy and Adam. Adam already has a young daughter, and we’ve seen how Mercy and Jesse’s relationship has evolved into a strong friendship and Mercy is a great step mother. Adam is an awesome father already, and as Alpha of a pack we see his authoritative side a lot. In this book we get to see Adam play a slightly different role with Aiden. Aiden is a 10 year old boy with no people skills, and a ton of fire power. Adam does a great job of giving him some structure, rules, and shows him a warmth that Aiden has lacked for the majority of his life. I’m hoping this storyline is setting us up for another child. Imagine, a child who could be a coyote or a werewolf. Or a coyote-werewolf! Also, Mercy carries a lot of magic, so what would that child inherit? There are endless possibilities! 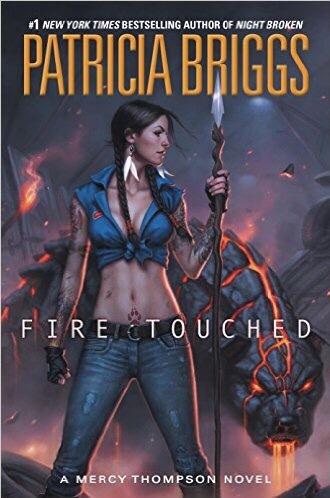 Patricia Briggs never disappoints in this series, and Fire Touched did not stray from that path. I was given a pre-release copy from the publisher Berkley Publishing Group through NetGalley for my honest and unbiased review. In this case, it was a joy to give it! I’m sure it is on many of your TBR lists. It will be released on March 08, 2016. Buy it on Barnes and Noble! Can’t wait to read it, especially now! Mercy is one of my favorite characters along with Kate Daniels. Both strong female leads. Goodreads has done an interview with Patricia Briggs that is really interesting also. I just posted it on Facebook. She answers some questions I had…. I read that yesterday. Interesting thoughts about Mercy getting pregnant in that interview. I was a bit disappointed, but she didn’t leave out that possibility, at least.